Katherine Lewis, a mom of three, volunteer and Girl Scout leader, was perplexed. The Rockville-based mom will be at The Ivy Bookshop on Wednesday, May 30 to read from the book and share some of its insights. “This book grew out of me trying to understand,” she says. Lewis spent five years researching the book which advocates for what she calls the “Apprenticeship Model,” an approach that focuses on collaboration and helping kids acquire the skills they need for a wide range of life situations. One of Lewis’ starting points was a survey from the National Institute of Mental Health. Researchers there studied more than 10,000 U.S. children and determined that one out of two kids will experience a mood/behavior disorder or substance abuse by age 18. ADHD, depression and anxiety are included in the category of mood/behavior disorder. Anxiety is the biggest culprit of the three with the study finding that it affects 32 percent of American children, Lewis says. 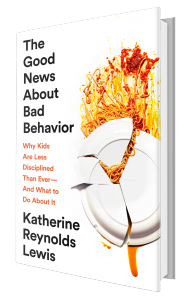 Delving deeper into the issue, Lewis came upon one of the book’s first takeaways: “Kids need more support in managing themselves.” Often when they act out, she says, it’s not out of defiance, but because they don’t have the know-how for that particular situation. Why is that, parents might wonder. In the past three decades, three big changes in society have affected kids, Lewis says. They are the decline of unstructured childhood play, the growth of social media and technology and a lack of employment for children, which could mean no part-time job after school or no chore assignments in the home. Many parents now have “wonderful goals” for their children’s academic, athletic or artistic achievements. But kids can also learn a lot from a job, she says. Speak less, act more. Avoid long lectures by simply turning off the video game or moving out to the car when it’s time to leave. Mumble and walk away. That sounds counterintuitive to good communication, but Lewis says when parents are on the verge of yelling or about to give in to whining, they can pretend they forgot something on the stove or in another room and use that getaway as a chance to collect themselves. “Even 30 seconds give us better, conscious parenting skills,” she says. Intrigued? Lewis’ reading starts at 7 p.m. at The Ivy Bookshop. theivybookshop.com. For more information on the author, visit katherinerlewis.com.